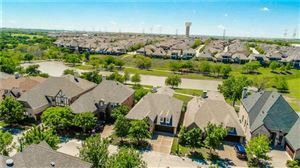 Just minutes from the Dallas North Tollway, this master planned community consisting of 1,150 acres has nature trails, beautiful sunsets, and amenity centers. Resort-style pools, gardens, parks and playgrounds, beautifully landscaped canals and hundreds of acres of open space provide year-round activities for the modern family. The Tribute showcases many of North Texas’ most prominent and distinguished builders, offering home designs that emphasize the Old World-themed atmosphere of the community.